A Kid’s Guide to Summer | Kids in T.O. Too often I get caught up in creating and curating the perfect to-do list for my family in TOw. 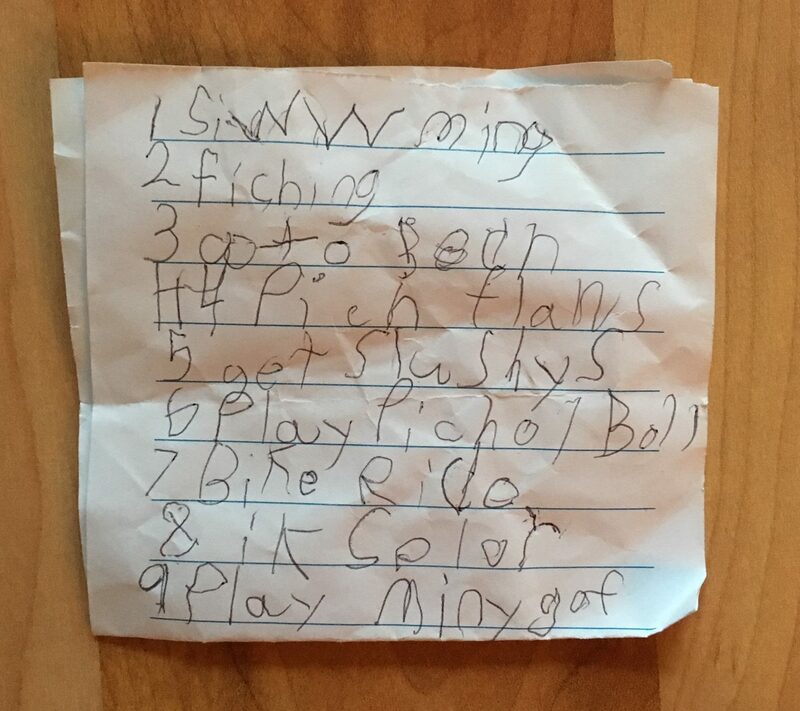 So thank you to my awesome niece for sharing her summer wish list with me. What’s on your family’s list for the last month of summer? See below for some ideas where you can get this list done in Toronto. 1 – Swim. The City of Toronto operates 57 public pools – here is a review of some of the best. 2 – Fish. Did you know that you can basically fish anywhere along Lake Ontario? Here are some popular spots to fish in and around Toronto. 3 – Go to the beach. There are all sorts of beach experiences in T.O. One of the only places where you can sink your toes into the white sand is at Sugar Beach. Bring sand toys and park yourself under the pink umbrellas. 4 – Pick flowers at the Toronto Botanical Gardens. Ok, you can’t actually pick the flowers, but you can definitely enjoy the gardens for free. There is also a Children’s Learning Garden and a bee hotel. 5 – Get a slushy fix (and snow cones and ice cream and the latest food trend) at The Ex. Here is our first-timer’s guide to The CNE. 6 – Play Pickle Ball. Okay, anyone know where kids can play pickleball in this city? Adults can drop in and play at the Miles Nadal Jewish Community Centre and Milliken Park Rec Centre. 7 – Bike Ride. Here is a review of some of the best bike paths in the city and news on the soon-to-be installed bike lanes on Bloor St. W.
8 – Explore the ravines. 9 – Play mini golf. Here are some places to mini-golf in the GTA. You can do an indoor glow-in-the-dark version at Just for Fun and out of town, try the course on the slopes of Horseshoe Resort near Barrie.